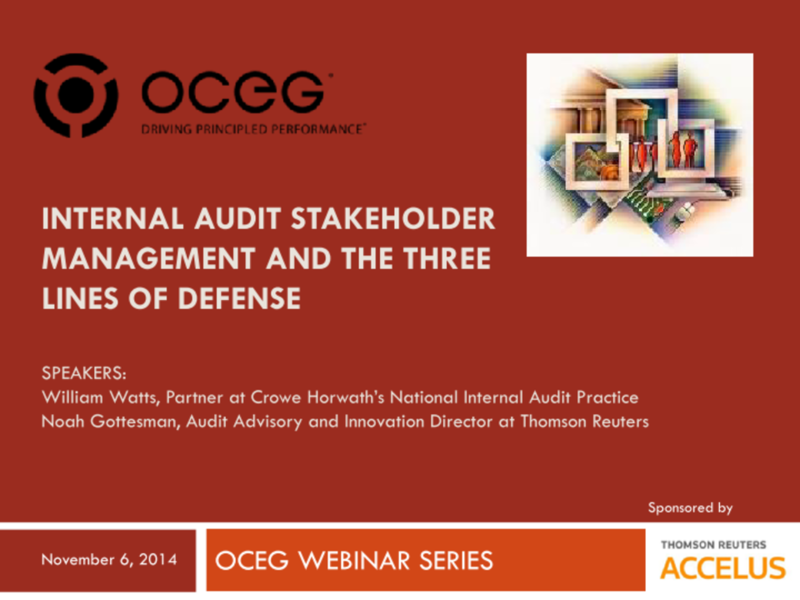 Stakeholders are key to the success of an internal audit function. From the board of directors to the audit committee, from regulators to outsourced suppliers, internal audit deals with a varied range of stakeholders that are integral to an effective internal audit function. If internal audit doesn’t get this right, then there could be a negative effect on a firm’s corporate governance. But the other two lines of defense are an important part of this equation, and a strong, two-way relationship can be mutually beneficial. We have emailed instructions to access Internal Audit Stakeholder Management and the Three Lines of Defense Slide Deck to . Make sure the email arrives in your inbox: either add "support@oceg.org" as a safe sender to your email platform, or if you use Gmail, drag our email into your Primary tab.